The fifth-grade class of Carrie Pulli at Martin Elementary School enjoyed an out-of-this-world lesson on space, including face-to-face chat with a NASA expert. “I contacted NASA a couple of months ago hoping they would talk with my students and deepen their understanding of our solar system and space,” Pulli said. 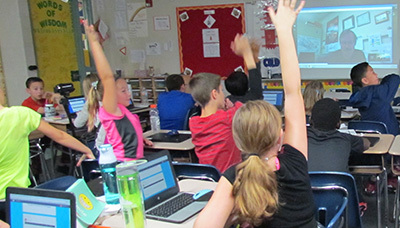 The chat with NASA Educator Roger Storm earned stellar reviews from students. Pulli said who were thrilled to learn first-hand about secrets of the solar system. Video of the chat was shared with other fifth-grade classes as well, so that all students got to share in the fun.